Branson.com received the prestigious ‘Best U.S. Destination GeoDomain Award’ at the 2008 GeoDomain Expo held on July 10-12 at Chicago’s W Hotel City Center. The GeoDomain Expo, sponsored by Associated Geos and The Kelsey Group, is the largest and most important gathering of owners of the most successful U.S. and international ‘major city’ and ‘destination’ focused websites. Branson, MO (July 30, 2008) — Branson.com received the prestigious “Best U.S. Destination GeoDomain Award” at the 2008 GeoDomain Expo held on July 10-12 at Chicago’s W Hotel City Center. The GeoDomain Expo, sponsored by Associated Geos and The Kelsey Group, is the largest and most important gathering of owners of the most successful U.S. and international ‘major city’ and ‘destination’ focused websites. 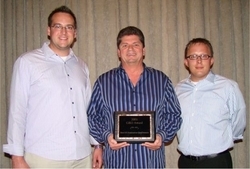 On hand to accept the Best U.S. Destination GeoDomain Award for Branson.com were (from left) Projects Director Josh Stauffer, Owner and Founder Larry Milton, and Marketing Director Jeremia Froyland. Branson.com’s Owner and Founder, Larry Milton, stated “I am very excited to accept this award on behalf of the entire Branson.com team. Our developers, project managers, creatives, analysts and sales managers have poured their collective hearts and souls into this site and this award is a testament to their hard work. Our focus has been to become the definitive source for all-things-Branson and, I am proud to say, that in just a little over two years of operation we have made a significant impact on our community.” Attendees of the 2008 Expo were given an opportunity to network with principals from more than 85 high-profile member websites and to participate in informative industry seminars and social events. Branson.com’s Director of Marketing, Jeremia Froyland, led a spirited presentation on Technology for GeoDomains. Among his subject areas were developmental strategies, content production, syndication, social media, metrics in the mobile markets, partnership development, widget/gadget technology features, inter-active maps, and online video. Associated Geos (formerly Associated Cities) and its affiliated member network of over 110 innovative city and destination websites, offers targeted local content, activities and information for residents and travelers. Their extensive network reaches 6 Million monthly unique visitors delivering 60 Million impressions. The Kelsey Group is a leading provider of strategic research and analysis to help organizations evaluate business, social, economic and technology trends.